"You can shine no matter what you're made of." 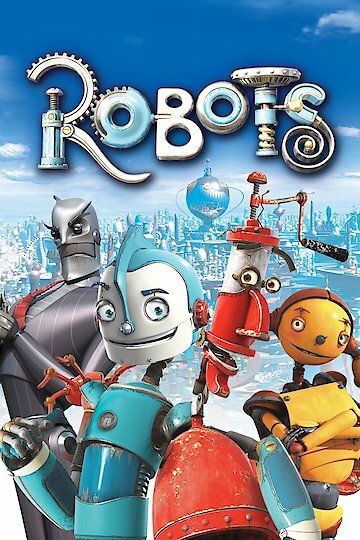 Robots is a full-length computer animated film featuring a world of robots. Rodney, a robot from a modest middle class family, sets off to the big city to pitch his inventions to Mr. Bigweld of Bigweld Enterprises. Rodney is an inventor who believes in making the world a better place. At the start of the movie, Rodney works as a bus boy at a local restaurant where his father is a dishwasher. When the robot he invents to ease his father’s job breaks most of the dishes, Rodney loses his job and puts his father in debt. He decides to go to Robot City, where he hopes to make enough money to pay off his father’s debt and work as an inventor with Mr. Bigweld at Bigweld Industries. At first Rodney is refused entry at Bigweld Industries, but he does not give up. Eventually he learns that the factory, under the management of the handsome but ruthless Ratchet, plans to stop making replacement parts and sell only expensive upgrades. Those who cannot afford upgrades will die and be melted down as scrap metal. The young inventor falls in with a group of “outmodes,” old robots who rely on hand me down and spare parts to keep themselves in order. As the supply of spare parts dwindles, Rodney draws strength from Mr. Bigweld’s motto “see a need, fill a need.” He uses his mechanical talents to fix robots who cannot afford the expensive upgrades and save them from the “sweepers” who would take the irreparable machines to be disassembled and melted down. Meanwhile, Rodney learns that his father’s parts are failing and replacement parts cannot be found. With nowhere left to turn, Rodney seeks out Mr. Bigweld himself. All seems hopeless when Mr. Bigweld refuses to step in, and Rodney calls his father from the train station to tell him what has happened. Rodney apologizes for letting his father down, but Mr. Copperbottom tells his son “a dream that you don’t fight for can haunt you for the rest of your life.” Just as Rodney decides he must stay and fight back against Ratchet, Mr. Bigweld appears. He’s been inspired by Rodney’s determination and found the will to fight back. They band together with all of the “outmodes” and form an army to fight Ratchet and restore goodness and kindness to Robot City. Robots is currently available to watch and stream, buy on demand at Vudu, iTunes, YouTube VOD online.